Greetings from Himalayas in the Name of its Maker! We would like to request you to pray for our trip to the mountains. My friend and I are leaving in 6 hours to the midwestern nepal. We will have to drive for two days and hike up to the snow level for two days just to get to Barekot village in Jajarkot district. Six boxes of literature ie 4000 pieces are loaded in the car. Please pray for travel mercy, boldness and fruitful ministry. We will be teaching for two days to the pastors and the students in a short discipleship training. We are excited to go to the real ends of the earth with the Gospel. Please pray with us that the Lord provides for the trip and His will be done! Thank you very much for your continuous prayers. Ps. Please pray for Sister Asha. She heard the gospel from us few years ago when she came to Kathmandu from her Village for higher studies. She worked for us in our book store for two years and she attended our church even though her orthodox Buddhist family strictly prohibited. Now she knows the truth and bough her Bible, and ready to go to Japan for higher study. In the picture Brother Hem is sharing with her from the Bible. Her husband is not happy about her faith, neither her father in law who is a Buddhist monk and has a huge monastery in his own house in the village. 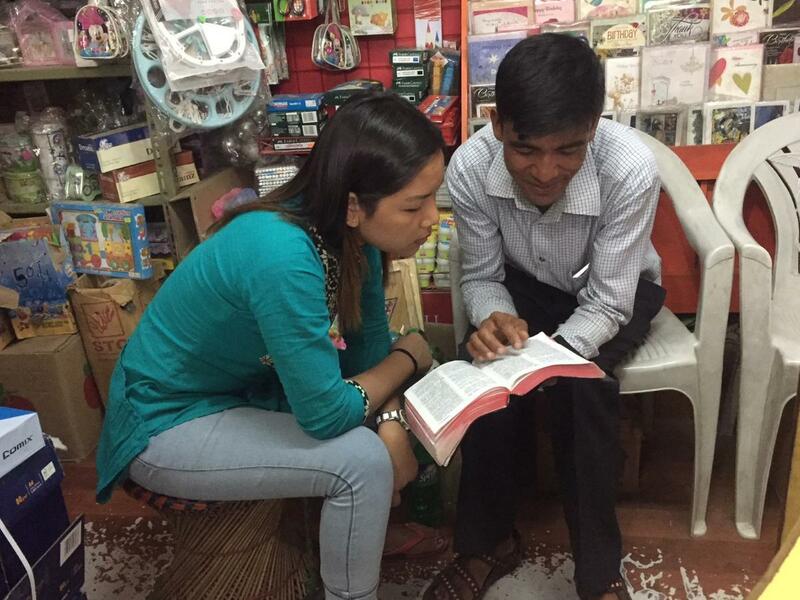 Please pray for Asha that she finds a Biblical Church in Japan. Thank you very much.